"The Empty Tomb," The Jesus Database, an online annotated inventory of the traditions concerning the life and teachings of Jesus. Dr. Gregory C. Jenks, FaithFutures Foundation. Book VIII, Chapter 16, Ecclesiastical History, Eusebius of Caesarea, (c. 320). "The Tomb of Jesus; Matthew 28:6," Charles H. Spurgeon, 1855. Commentary, Holly Hearon, Working Preacher, 2015. Easter, I Love to Tell The Story Podcast, Working Preacher, 2015. Come, See, Go, Tell, commentary and discussion, RevGalBlogPals, 2015. Don't miss the 11th Hour Preacher Party on Saturday! Commentary, Melinda Quivik, Matthew 28:1-10, Easter A, Preaching This Week, WorkingPreacher.org, 2014. "The sermon on this day should propel the assembly to leave worship with both awe and celebratory power, eager to see where and how the risen one will meet them in their neighbors and friends, their prayer, their advocacy for what is good and just, and in their own gratitude for life and resurrection." "My Favorite Angel," Alyce M. McKenzie, Edgy Exegesis, 2014. "Why is it that we so often only hear the first half of Jesus' prediction: 'The Son of Man will suffer and be killed...' and forget what comes next?" Lectionary Greek, Rob Myallis, 2014. "How have you seen the promise of and hope of 'maybe, just maybe' breaking into your world of late?" "Easter Vision," Nancy Rockwell, The Bite in the Apple, 2014. "So I Believe," Alan Brehm, The Waking Dreamer. "I may never understand Easter, but because Jesus is alive and well in the community of faith, I believe in a God who is working to bring grace and peace and mercy and love and freedom and joy and life into every life." Comentario del San Mateo 28:1-10, Gilberto Ruiz, Working Preacher, 2014. Commentary, Rolf Jacobson, Matthew 28:1-10, Easter A, Preaching This Week, WorkingPreacher.org, 2011. "It is only fitting that just as the tomb will not contain Jesus, neither can Mark's story. Jesus is not bound by its ending; he continues into the future God has in store for the creation." Jesus' Resurrection, audio telling, story in episodes, graphic, audio and written commentaries. Go Tell Communications, Biblical Storytelling for the Global Village, 2011. "From despair to bewilderment, from fear to faith, from sadness to joy. What an Easter journey." "We need to proclaim a radical resurrection faith in the present, not just a historical event." "And have you noticed? Mary Magdalene is often at the feet of Jesus." Holy Textures, Understanding the Bible in its own time and in ours, Matthew 28:1-10, David Ewart, 2011. "First Thoughts on Year A Gospel Passages in the Lectionary: Easter Sunday," William Loader, Murdoch University, Uniting Church in Australia. "We should not see the event as proving resurrection as a belief, since that would have been widespread. It was more that this Jesus had been raised, had been raised first of all, and, as follows later in the chapter, has a role to exercise and a commission to give. That commission, in turn, directs attention to the ministry and teaching of Jesus as the good news." Commentary, Matthew 28:1-10, Arland J. Hultgren, Preaching This Week, WorkingPreacher.org, 2008. "From Tragedy to Joy," Larry Broding's Word-Sunday.Com: A Catholic Resource for This Sunday's Gospel. Adult Study, Children's Story, Family Activity, Support Materials. "How has tragedy touched your life? How have you reacted? How have you growth from the experience?" "God Goes Ahead of Us (Matt 28:1-8)," John C. Purdy. Chapter 12 of God With a Human Face (1993), republished at Religion Online. "As so often happens, the great discovery was the work of amateurs. An amateur is, in the primary sense of the term, a "lover." Surely the Marys went to the tomb out of love...if we know anything of human nature, we know that love was the primary force that drove them there. Love is a more reliable alarm clock than Faith or Hope - more likely to get you out of bed and get you going early in the morning." "Empty Tomb," "Death and Resurrection of Jesus," "Resurrection Appearances of Jesus," wikipedia. Baker, James T., "The Red-Haired Saint: Is Mary Magdalene the Key to the Easter Narratives?" The Christian Century, 1977. Brisson, E Carson, "Matthew 28:1-10," Interpretation, 2011. Brown, Raymond E., "The Resurrection in Matthew," Worship, 1990. Clayton, Kimberly L., "When Death No Longer Determines Our Living," Journal for Preachers, 2008. Sermon. Cousar, Charles B., "Make It as Secure as You Know How," Journal for Preachers, 2003. Heil, John Paul, "The Narrative Structure of Matthew 27:55 - 28:20," Journal of Biblical Literature, 1991. Jarvis, Cynthia A., "Matthew 28:1-10, Expository Article," Interpretation, 1988. Kopas, Jane, "Jesus and Women in Matthew," Theology Today, 1990. Minear, Paul S., "Matthew 28:1-10, Expository Article," Interpretation, 1984. Streets, Frederick J., "Expectation," The Christian Century, 1993. Weaver, Dorothy Jean, "Matthew 28:1-10, Expository Article," Interpretation, 1992. Wenham, D., "The Resurrection Narratives in Matthew's Gospel," Tyndale Bulletin, 1973. "Buried with Christ -- Raised with Christ," - Easter Vigil - 27 March 2005, Hubert Beck, Göttinger Predigten im Internet: Every Sunday Sermons based on the RCL by a team of Lutheran theologians/ pastors. "Promises," Talks to Children, Rev. Donald McCorkindale, Dalgety Parish Church, Fife, Scotland. "The Bodysnatchers," Jane and Mark Lewis, Potted Jam. "Sunrise TV," Jane and Mark Lewis, Potted Jam. "The First Day of the Week," from A Certain Jesus by Jose Ignacio and Maria Lopez Vigil. Ideal for catechetical and liturgical dramatization of today's gospel. Claretian Publications. "Mourning for Jesus," Michael English, Milton Parish Church Drama Resources. 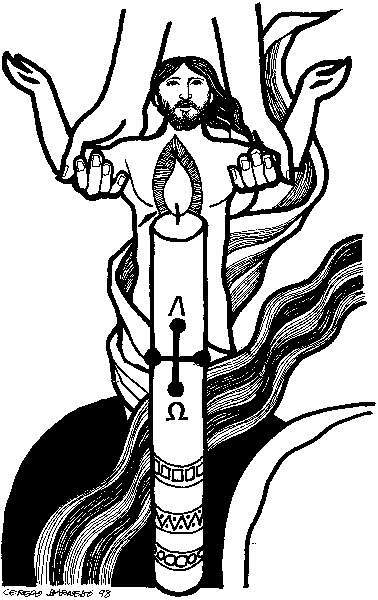 Easter Sunday, Lectionary Clipart, Hermanoleon Clipart. Matthew 28:1-10, at Cerezo Barredo's weekly gospel illustration. Liberation emphasis. Hymns with Scripture Allusions: Matthew 28:1, 2, 5, 6, 7. The Cyber Hymnal.